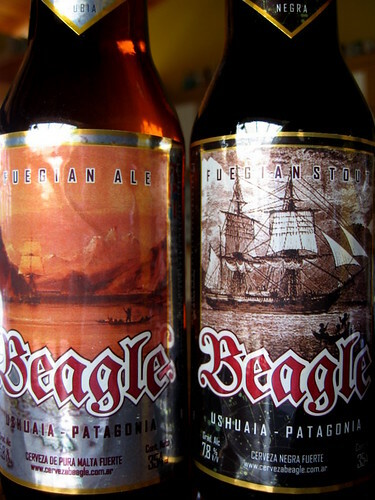 Located in the mountainous seaside city of Ushuaia, Cerveza Beagle has been producing artisanal craft beer for, um, some time–I can’t find their founding date anywhere. In case you didn’t know, Beagle was the name of the famous ship, HMS Beagle, which sailed around the southern part of South America and performed a variety scientific surveys. Charles Darwin was also on board studying nature or something. Anyway, that ship achieved such notoriety that someone decided to name a strait after it, the Beagle Channel, which just so happens to be where Ushuaia sits. Like many artisanal products that built a name for themselves, Beagle was born from the simple idea of making beer to share among friends. I have yet to visit their establishment, and their website is in perpetual “under construction phase”, so I don’t have a clear picture of their operation. That may change in the near future. I do know of three beers that they currently produce, Rubia-Ale, Negra-Stout, and Rojo-India Pale Ale. All of them are unfiltered and contain quite a substantial amount of yeast particles, so if you ever come across a bottle, pour with care. Let me say that I’m not an experienced beer reviewer, as I posted in the Beer Is A Tasty Beverage posts, but I’ll make an effort. Fuegian Rubia-Ale: 5.8% Alcohol. Nice honey color. Strong freshly baked bread aroma with fruity notes. Mildly bitter from start to finish. Long yeasty aftertaste. Finely carbonated. Overall, the more I try this beer, the more I like it, but I’ll say it is average for other unfiltered beers in the same class that I have tried. I’m not too keen on the very long bitter aftertaste, but I haven’t had much exposure to good beers recently so my taste buds are probably off a bit. Fuegian Negra-Stout: 7.8% Alcohol. Dark coffee color. Finely carbonated. This beer screams of dark chocolate and coffee in both aroma and flavor. Slightly creamy texture but not overly so. Mildly bitter yet somewhat crisp from start to finish. Flavor-wise, if I didn’t know this beer had almost 8% alcohol, I would have never guessed. Of course, after a few, my judgement was impaired. Overall this beer is very well balanced with great complex flavors. I like to think of it as Guinness on steroids. Rojo-India Pale Ale: 6.6% Alcohol. Caramel color. Fruity yet yeasty aroma. Creamy texture but with enough carbonation to add some bite. Hoppy with hints of citrus. Bitterness is nicely balanced by mild malty sweetness. Like Beagle’s rubia ale, that bitterness lingers quite a bit. Overall, this beer definitely fits into the India Pale Ale classification and is very well-rounded. There are tons of other artisanal craft beers in Argentina that I still have yet to try, but Cerveza Beagle produces some really great beer compared to many others. Like Antares, they are now one of my favorite brewers of beer in this country. Perfect to sip on while the meat is roasting away. Also, I love the fact that their beer is unfiltered because each bottle seems to have its own unique properties.